How To Reset Refrigerator Display Panel? How do I reset the 1E error code on my Samsung refrigerator after a power failure? PRESS and HOLD the ENERGY SAVER button and the LIGHTING button at the same time for 10 – 15 seconds. After pressing the 2 buttons on the refrigerators display, your Samsung refrigerator will reset and resume normal operation. The ice maker should now dispense ice, and the water dispenser should now dispense water. PRESS and HOLD the ENERGY SAVER button and the LIGHTING button to reset. NOTE: Even if the ENERGY SAVER button and the LIGHTING button are not illuminated, you can still press them to get the refrigerator back to normal. Pressing the 2 top buttons will reset your refrigerator. 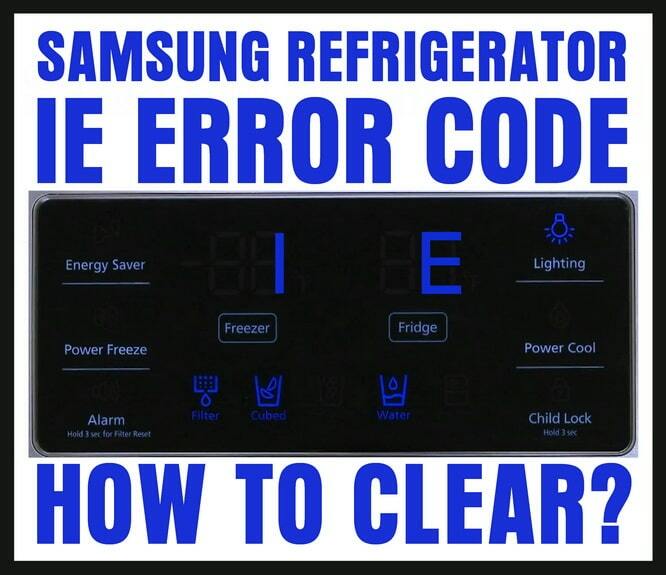 Some Samsung refrigerator owners have reported that after clearing the 1 E error code, the refrigerator will not cool. After clearing the error code, be sure the fridge is cooling, dispensing water, and dispensing ice. If you have problems after clearing the 1e error code, please let us know what the issue is by leaving your question below and we can assist with troubleshooting. I pressed and held the ENERGY SAVER button and the LIGHTING button which are not illuminated and nothing happened. I tried this several times, same results. We had a power outage where the lights went on and off 3 times then came back on. Additional information: the water and ice maker were shut off about 6 months ago because of a leak. My Samsung refrigerator, model number. Rf28hfedtsr will not reset by pushing energy and lighting switch or the freezer/ fridge switch. I have error 13 E on my display at startup and also when i run diagnostics. Can you tell me what 13 E is. My freezer has stopped working. Appreciate the help. How can we stop the Refrigerator’s Compressor running at full strength when it comes back after a powercut? It does it even if the power has failed for a couple of minutes. It is sending our consumption up immeasurably since there are 5 or 6 cuts minimum a day! I have a “40 E” error code on my Samsung French door refrigerator RF24SFEDBSR/BB. We moved the refrigerator from one house to another this morning. Waited 4 hours before turning ON. The Samsung Refrigerator Error 40E means the fan that supplies air to the icemaker is NOT working properly. Press and hold the top right and top left buttons on the control panel together for 5 to 10 seconds to attempt to reset the control panel. If your Samsung is plugged into power and also not blocked with ice then REPLACE THE FAN MOTOR. I tried it for the fifth time and it worked. The control panel is dark except for 1 E error code. I have pressed and held the energy saver and lighting buttons and no change. The frig will dispense water and ice and appears to cool ok. I have reset the Error Code: 1E as instructed and it has worked, but every few days, it returns and I have to reset again. What could the issue be for causing this code to continuously appear without a power failure. Previous post: Front Door Paint Is Peeling – How To Paint A Metal Exterior Door? Next post: Frigidaire Refrigerator Error Code SY CE – How To Clear The Fault Code?